When I was looking for my birth mother I couldn’t find any books that answered my biggest question: ‘Why did she feel she had no choice but to give me up?’ All I could find were misery memoirs or books for social workers. Neither did the job. I needed something accessible but serious that told the hidden story of adoption in Britain in the 20th century. Meeting Steve Humphries and appearing in the ITV series of the same name, shown in 2005, gave me the chance to write the book I’d been looking for. But publishers have sales targets and they wanted my own search story to be a central part of it. I was very unsure. Could I write something so personal? Could I write it at all? I was persuaded I could, and I found a way to weave my story into the wider history of adoption. I finally had my question answered, and I know from the letters I got afterwards, especially from women who’d given up their babies, that others had their questions and worries answered too. That’s the thing I think I’m most proud of. 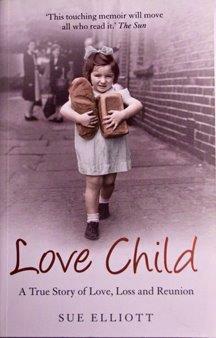 Buy Love Child on Amazon here.